Post-consumer waste such as milk jugs, pop bottles and plastic bags are the main ingredients	in these youth picnic tables, and to top it all off, the tables themselves are also completely recyclable. 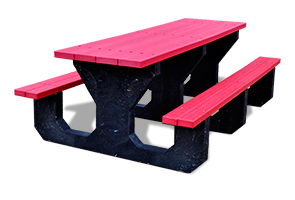 Help reduce the pollution of landfills with picnic tables that can be enjoyed for generations to come. Sturdy kid proof picnic table where kids can be kids. Designed specifically for kids comfort and constructed from recycled plastic so there is need to worry about splinters or any spilt milk. The recycled plastic washes clean with simple soap and water and will not corrode or rot. Available in the colors as shown.